If you love candles then today’s craft is going to make you very happy. 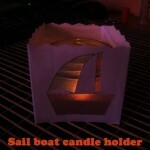 I’m going to show you how to make a Sail Boat Candle Holder. Made from a piece of cardboard and transparent paper this candle turns out beautifully. The candle shimmers right through the transparent paper onto your wall. You’ll gonna love it!! Just keep in mind you will need some help from an adult to light the candle. Never light it without adult supervision. So, let’s get started. I have a really fun craft for you today. 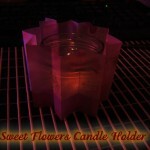 I am going to show you how to make a Sweet Flowers Candle Holder. This craft turns out really magnificent. With the use of transparent paper around the outside of a candle the glow of the candle looks really lovely glowing through the transparent paper. Keep in mind, you will need adult supervision for this craft. Candles aren’t something to play with, so make sure to have an adult around to light the candle as well as stay in the room once the candle is lit. With that being said…. let’s start the craft.